Hyperion Shakespeare Company’s “Richard II” attempts to interpret Shakespeare’s play anew by using an all-female cast, with limited success. Hyperion Shakespeare Company’s “Richard II” wants very badly to explore the politics of gender. 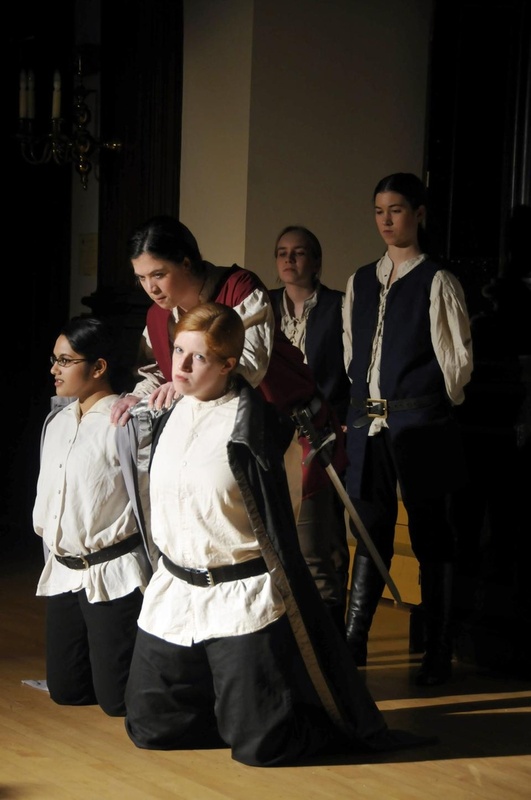 The production, which ran this weekend in the Horner Room of the Agassiz Theater, brings an all-female cast to Shakespeare’s history play in an attempt to question the nature of power and whether an authoritative ruler needs to be aggressively masculine. In reality, however, the production only half succeeds in its goal; though it successfully reinvents the character of Richard, it leaves the rest of the cast lagging behind. The directorial decision to focus on Richard reduces the play from a deep meditation on power to a simple, albeit fascinating, character study. “Richard II” is a surprisingly underrated work, often lost in the adoration heaped upon Shakespeare’s more famous plays. Yet it is one of his most vital and affecting pieces; the tale of Richard’s deposition by Henry Bolingbroke addresses the key question of what it means to be a king and what it means to overthrow one. By approaching this classic tale of Richard II with a new angle, Hyperion ambitiously turns the audience’s attention to a play worth exploring for its mix of political and personal drama. The original portrayal of Richard II cast the ruler as weak, poetic—even feminine—and constantly struggling to live up to his position. The decision by director Meryl H. Federman ’11 to use only female actresses for this production appears to be motivated by this original depiction, and it is a choice that defines the play. The production makes no effort to bring any other new aspects to the script, relying solely on its unorthodox casting to make its claims about femininity. A very static performance, “Richard II” features little physical action besides two very brief sword fights and the comically repetitive throwing down of gauntlets to challenge enemies. Generally the actors stand in one place and deliver their lines, moving only occasionally to engage the other characters. The stage is similarly uneventful. The intimate Horner Room is barely altered; a throne and the room’s balcony are the totality of the set. The production therefore relies totally on its actresses’ ability to shed new light on their characters. As Richard, second year Harvard Law School student Nicole Kinsley is remarkably successful in uncovering unexplored depths of her character. Her performance as the king is the undoubted triumph of the production and lends some justification to the use of an all-female cast. Initially, she seems uncertain in the role; it is very apparent that she is a woman trying rather unsuccessfully to play a man. As the play progresses, it becomes evident that this characterization is deliberate: Kinsley’s struggles with masculinity mirror those of Richard’s with kingship. Eventually, Kinsley blossoms, becoming a fascinatingly deep character. Even as Richard loses his grip on his crown and his sanity, Kinsley projects more assurance than might be expected from the role without losing any sense of her character’s pathos. When she says, in Richard’s final monologue, “Thus play I in one person many people,” her performance fully justifies the line. While Kinsley’s performance matures as the play goes on, the portrayal of Bolingbroke by Emily B. Hecht ’11 moves in the opposite direction. Whereas Kinsley is hesitant in the opening exchanges, Hecht delivers her verse with authority, exuding confidence and manliness. 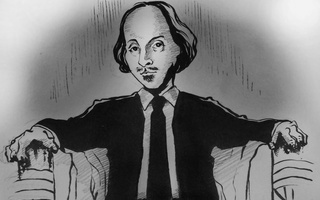 As the play progresses, Bolingbroke also becomes a more complex character—though, compared to Richard’s, this transformation is much less satisfying. Faced with Richard’s defeatism but continuing righteousness, Bolingbroke has no retort. This is less the fault of Hecht than the performance as a whole. Whereas the early contrast between the two rivals for the throne is enlivened by the use of actresses, a feminine portrayal does nothing for Bolingbroke as the play goes on. In Shakespeare’s original, Bolingbroke becomes a less assured character after becoming King Henry IV, but Federman’s mission to explore femininity in politics leaves Hecht with nowhere to progress. 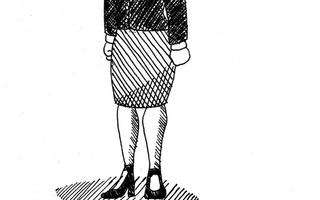 She can’t revert to femininity, because Henry simply becomes less confident rather than more womanly. This plot progression allows her no other option but to simply retreat into the background and let her personality fade, leaving Richard free to dominate the stage. The decline in Henry’s character exposes the essential flaw in Federman’s scheme. Having a woman play the king is fascinating, but having women play all of the other roles too is essentially meaningless. Exactly the same effect, or an even stronger one, could have been created with Kinsley as Richard and more conventional casting. Almost all of the supporting performances are strong, particularly that of second year HLS student Mary R. Plante as Bolingbroke’s father, John of Gaunt. However, these depictions don’t tell us anything new about the characters. An additional problem with the sole use of female actresses is that the two main female characters, Queen Isabel and the Duchess of York, feel compelled to deliver their lines in excessively high-pitched voices, as if attempting to declare “I’m a real girl!” to the audience with every line. It is disappointing that a play so obsessed with the supposed femininity of politics has so little to say about femininity itself. More than half a century after Joseph E. Murray made history by conducting the first successful human organ transplant in 1954, he drove for four hours to attend the funerary services of an old patient—the man who had donated his kidney in that original surgery.